Take a Look Inside the 2017 Honda Odyssey Touring Elite! Is the Honda Odyssey Touring Elite the Ideal Minivan? Each year, West Michigan drivers must sort through more and more information in order to find the vehicles that best suit their needs! Lucky for them, the clear superiority of the 2017 Honda Odyssey Touring Elite trim is making the search a little easier. Unlike other minivans, the Odyssey Touring Elite trim comes filled to the brim with incredible technology features, and what’s more, it’s one of the most spacious, comfortable vehicles on the road today! In fact, the 2017 Honda Odyssey has so much to offer that the reviewers at U.S. News & World Report named it as one of the Best Cars for Families in 2017! * Find out what the unparalleled and unmistakable Honda Odyssey can do for you by reading on below! The Touring Elite trim is the most well-equipped of the models in the 2017 Honda Odyssey lineup, and it should come as no surprise that this minivan is loaded with many of the most powerful technology features available today. Features specific to the Touring Elite trim include an ultra-wide rear entertainment system with HDMI compatibility, a blind spot information system, a built-in HondaVac, and a 650-watt 12-speaker Premium Audio System. Of course, the Touring Elite trim also offers the best technology features of the Odyssey’s lower-end models, and that means drivers will also receive tri-zone automatic climate control, a rearview camera, push-button start, and more! In addition to offering 170.1 cubic feet of passenger space and up to 148.5 cubic feet of cargo space, the 2017 Honda Odyssey Touring Elite trim can boast a wide variety of comfort-enhancing and space-saving standard features. This trim comes equipped with 60/40-split third-row Magic Seat, wide-mode adjustable second-row seats, and a multi-function second-row center seat, making it easy to load up passengers and convert seating space into cargo room. Heated front seats, a 10-way power-adjustable driver’s seat, and a 4-way power-adjustable front passenger’s seat also come standard. Take the Honda Odyssey Touring Elite for a Test Drive! When West Michigan drivers explore our current offers and finance options, they’ll discover that it’s easier than ever to own the 2017 Honda Odyssey Touring Elite. Test drive this one-of-a-kind minivan—or any of our other impressive Honda models—by visiting a West Michigan Honda Dealer near you! Once you’ve had the chance to experience the Odyssey, we know that you won’t be satisfied by any other minivan. 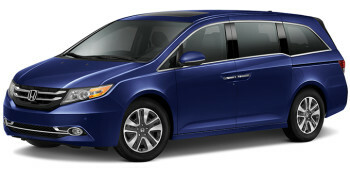 0 comment(s) so far on Is the Honda Odyssey Touring Elite the Ideal Minivan?